My friend Bobbie found this recipe on the world wide web, if it’s yours, please send me a link so I can give credit! 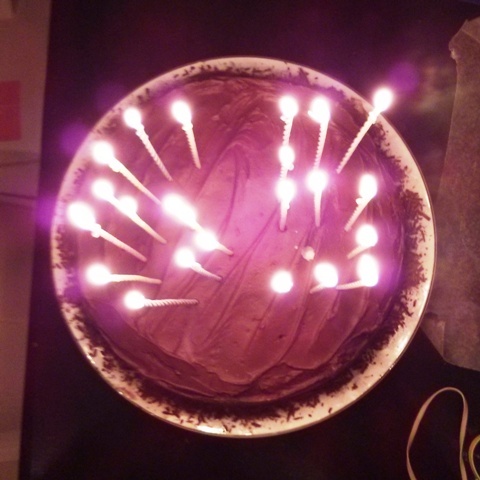 Bobbie and I made this as a birthday cake for her boyfriend and I made it again for my Dad’s birthday last month. This recipe is for a moist, springy, not too sweet cake and it was a big hit with everyone. No one seemed to notice it was mostly sugar and carbohydrate free, perfect if your dad has diabetes and you want to make him a birthday cake he can healthfully enjoy! Yes there is some apple sauce in the cake, and, no apples are not on the Candida diet but they also do not contribute a lot of sugars to the over all cake. 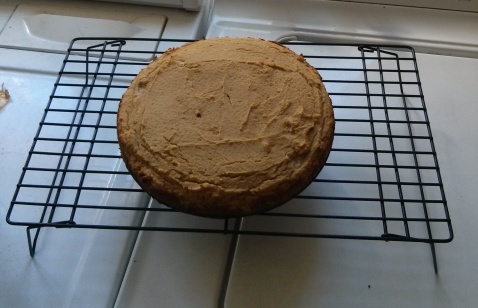 The apple sauce adds a lot of moisture and contributes to the texture of the cake. I would recommend having a slice and sharing (or freezing) the rest. The chocolate frosting is just melted chocolate with heavy cream aka ganache. I have been trying out stevia sweetened chocolate with erythritol (sugar alcohols fermented from non gmo corn) and so far Coco Polo is the winner in the dark chocolate category. It’s nice to know when I get a chocolate craving I can satisfy it without creating more sugar cravings. Preheat your oven to 350 degrees. Grease and then line the bottom of a 9 inch round pan with parchment paper. I used a spring form pan. Sift the coconut flour into a bowl and then combine with the rest of the dry ingredients. In a separate bowl, beat the eggs until frothy. Add the room temperature (soft or liquid) coconut oil, beat well, then add the rest of the wet ingredients. Add the dry ingredients and mix well to combine. Add the stevia, a dropperful at a time until the batter tastes sweet to your liking. Pour the batter into the prepared pan and bake until a toothpick or knife inserted into the center of the cake comes out clean- about 30 minutes. If you are looking for a more in depth how to, try this! 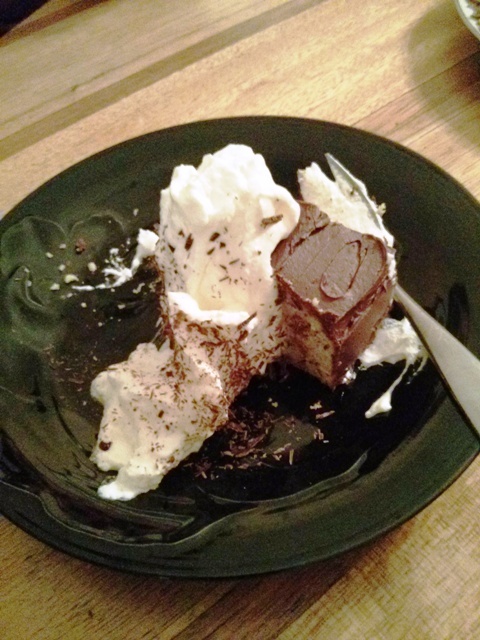 Coarsely chop the chocolate and place in a bowl. Warm the cream just barely to a boil over medium high heat. Pour the heated cream over the chocolate and salt. Let sit for 10 minutes, do not stir! 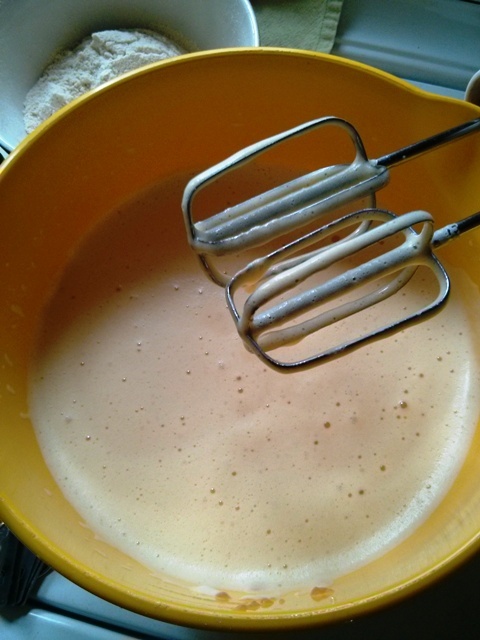 After 10 minutes, stir with a whisk to emulsify. Be sure to scrape the bowl with a spatula to incorporate everything. 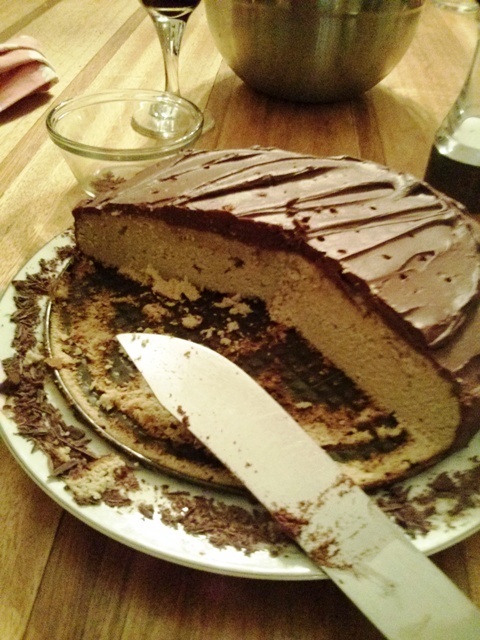 Spread slightly cooled ganache on a cooled cake and then refrigerate til serving. 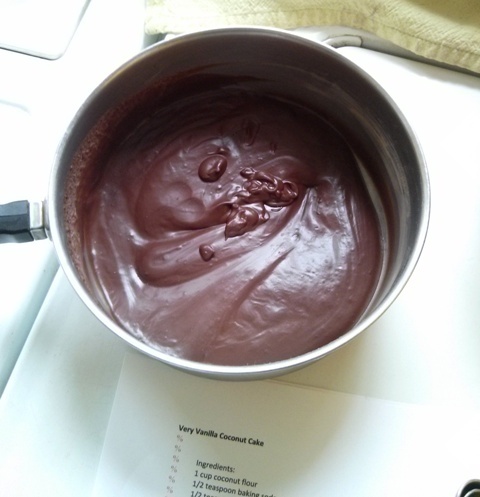 Let the ganache cool for an hour, stirring several times in between to keep it smooth. Then beat on high with a mixer til it’s fluffy. Frost with a knife or use in a pastry bag. Served with whipped cream, of course! Previous Pickled Jalapeno Peppers Next Squeaky Clean: Now with More Vodka! Wow! Thank you so very much, this is awesome and totally makes my week!!! I have been super busy with work lately and this is great timing, and will certainly inspire me to keep posting!